I power walked up the steep street which leads to the Santa Monica Mountain trails early this morning. The birds were singing, bees a humming and as the landscape shifted from homes to plant life the scent of white sage filled my lungs. 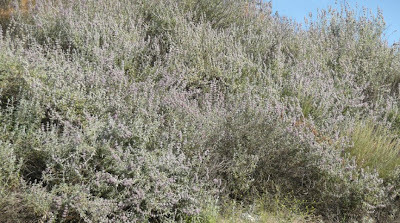 Salvia apiana, is a member of the California Chaparral Biome and held sacred by the Native People of America. It is the sage often used for smudging. We use it as our incense for its warm and woody fragrance. Our perfume Chaparral, consisting of botanical essences and handcrafted tinctures, is starting to run low. Inhaling the fresh, woody aromatics of the landscape, I contemplated deepening the palette of this fragrance. It’s time to go on a hike with Meghan, Queen of the Chaparral. Meghan is one of my girlfriends who has a deep connection with the flora and fauna. She is adept at tracking and embodies earth element. We’ve been attempting getting together since she returned from a sojourn in South Africa. The time is ripe! How wonderful. I have only had the opportunity to smell dried sage but I love it. What a lovely name! The essential oil of Salvia alpiana is similar to the scent in the wild. The aromatic is a bit "fresher" from the live plant where as both the essential oil and the dried variety has more of a camphoraceous quality. I bet you have some beautiful aromatic plants in your part of the world. How terrific to meet you. I love your blog and what you are doing. I organized a holistic moms group just after birthing my daughter naturally with another new mom. It was before holistic mom groups existed. We would meet once a month at The Phoenix Bookstore here in LA. Cheers to you and all things green and raising our children consciously! Ahh...thank you so much for that info. I will definitely look more into it. Nice graphic to represent your lovely name. I'll bet the native plants in Michigan are much more lush than our natives. Michigan, with it's change of season and much abundant rainfall, probably has natives more similar to that of Europe. I would love to hear what you discover on your adventure.